We, your priests, wish you every blessing and happiness. We hope you will find these notes helpful in your preparation for marriage. Your desire to marry in Church is your invitation to Christ to be at the heart of your relationship. Through this Sacrament, Christ will be with you, not only on the day of your wedding, but all the days of your life together. Your wedding is naturally, important to you but it is also important to us, your priests and your parish. We all benefit from good marriages, so we are happy to be involved and to help you in any way we can. Diocesan regulations require couples to contact a priest of their own Parish at least 3 months in advance: 6 months if under 18 years of age. Contact the Registrar’s Office – Tel. No. 6711968. Make an appointment with any Civil Registrar to give at least three months notice, of your intention to marry, in advance of your proposed date of marriage. Pre-nuptial Enquiry Forms – to be completed at meeting with your priest. The Bride-to-be’s papers (Pre-Nuptial Enquiry Form) will be completed by her local priest. The Groom-to-be will need similar papers completed by his local priest – very often in another parish, so early contact with him is also essential. As it is your wedding, why not make it so! Look over the various readings and texts that the booklet “Your Wedding” offers and choose the ones you like. There is a website www.gettingmarried.ie which may be of assistance. Your priest will help you with this. There are also many ways in which your family and friends can share more fully in the ceremony by reading Scripture, Prayers of the Faithful, bringing up the Gifts. If you would like a rehearsal of the ceremony, mention this to your priest as well. During the days before the marriage, you should prepare yourselves spiritually be receiving the Sacrament of Penance. At the wedding, if at all possible, not only the Bride and Groom, but their families and friends should receive Holy Communion. By sharing in the one Bread of Life, we are made one with each other in faith and love. Forms are available in Veritas and should be ordered at least 3 months in advance of your wedding day. A letter of recommendation is required before you apply for the Papal Blessing. Every effort is made to have the church in good condition on your wedding day. This involves heating, lighting, decor and insurance for all visitors and guests as well as cleaning and tidying of the church after your ceremony. A sacristan will also be in attendance. It is customary to make an offering in appreciation of and to defray the cost of the facilities provided. With regard to the Marriage Ceremony, we ask that photographs, flower arrangements, marriage booklets and music are in accord with the main occasion and are removed from the church after the ceremony. Marino Parishioners €200 – This will need to be given into the Sacristy at your wedding practice. Non Parishioners €300 – This will need to be given to the Parish Office on booking the Church to secure your place. The Sacristan €50 – This is given to him/her on the day of your wedding. People usually ask “how much do I give to the priest.” As you know, there is no charge for the administration of a Sacrament but many couples make an offering in accordance with their means. Arriving on Time: Out of courtesy to the Bridegroom, Guests, Priests, Sacristan and all who are involved we would ask the Bride to arrive on time. 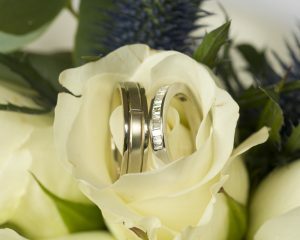 Best Man: The Best Man ensures that the following are brought to the Church: Rings and silver piece, Papal Blessing (if obtained) and the Church Offerings. Flowers: The use of flowers and plants, if arranged in good taste can heighten the joyous festive spirit of the marriage ceremony. Couples wishing to have the altar dressed by the ladies of our Altar Society who will supply and arrange the flowers, should contact Dorothy Maher at Tel: 01-8337313 or Sylvia Kavanagh at Tel: 01-8339880. If you wish to have your own florist, please let us know as soon as possible. Music: Linda McGann – Organist – Tel: 086-3667767 – Website: www.lindamcgann.com. Singers are available, and details can be had on request at the Sacristy – Tel: 01-8332772 – or from Linda at the number given above. Photographs: If you are engaging a photographer or a videographer, choose someone who does their work quietly and with minimum distraction. Make sure that they consult the priest in charge beforehand. Confetti: We would ask you to refrain from throwing confetti or rice in the church grounds. © 2019 Marino Parish. All Rights Reserved.